This is another trick that is easy to teach your cat by using a lure. 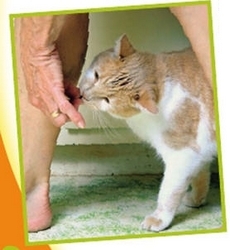 Cats tend to weave in and out of our legs anyway— especially when we’re making their supper. Find something your cat likes and get him playing with it. Have your cat on your left side and a toy on a stick or string in your right hand. This will be your lure. Take a step forward with your right leg, and wave the toy so that he jumps through the space between your legs. He should now be on your right side. Take a step forward with your left foot and transfer the toy to your left hand, once again dangling it so that he follows between your legs. You can also do this standing still. Use the lure to have your cat weave a ﬁgure-8 around your feet. It’s probably best to wear pants when you’re teaching this trick, in case he misses and grabs your leg instead of the toy. If he does, remember it was an accident and don’t be angry. Just try to keep the toy away from your body. For bow, you will need your touch stick and a clicker. To make the stick more interesting, you may want to attach a feather or toy of some sort to the end, or just use a feather wand toy. Start by playing with your cat a little. When he pounces on the end of the touch stick, he may automatically go into the bow position. If that is the case, click! Then let him play some more or give him a treat. Repeat several times. If your cat doesn’t do the bow on his own, try bringing the stick suddenly back toward him. This should make him go into the Leg bow position. Click and treat or play some more. Repeat several times to reinforce that this is what you want him to do.